At times, Quiproquo’s greenness comes not only from bitter galbanum, but also from what smells like a fresh cut leaf accord contrasted with a tiny bit of milky sap. This might explain what in Quiproquo smells, momentarily, like the tonka in Aviance’s drydown, softening its greenness with a wonderfully weird green fresh/milky combo. Comme des Garçons took a similar riff and extended into an entire perfume with their fragrance from 2000, Calamus, by Bertrand Duchaufour. Apparently, Quiproquo’s perfumer is Robert Gonnon, composer of some of the best late 1960s/1970s fragrances: O de Lancome (1969); Courrège Empreinte (1970); Lancome Sikkim (1971); Cacharel Anais Anais, (1978, with Roger Pellegrino, Paul Leget, and Raymond Chaillan); and Paco Rabanne Metal (1979). It’s clear Robert Gonnon loved the scent of green — of galbanum, leaves, aromatic herbs, and citrus. Like Germaine Cellier, he returned again and again to work with green, fresh notes, retaining their fortitude while giving them a lightness, an insouciance. There's something to be said, of course, for overdosing, as Cellier did with galbanum in Vent Vert, but Gonnon seemed to specialize in creating — out of wild and sometimes harsh perfume notes — subtle fragrances with quiet intensity. I searched far and wide for information on Gonnon, at times not even sure if his last name wasn't Gannon, which is how some people spelled it. And yet, I could come up with nothing but his dates of birth and death (1926 - 1988), and a list of his perfumes. Not a photo, a bio, an interview. How did he get into perfumery? Who were his favorite perfumers, his favorite perfumes? I'm still digging around, and hope to upate this post if I find something out. After some time, if you collect perfume, you may find yourself at the point of your perfume connoisseurship — or obsession, I'm not sure they're distinguishable — with a single perfumer's entire oeuvre. I didn't realize until I found out that Gonnon composed Quiproquo that I'd smelled every scent listed that he ever created. In a way, I guess I already know Gonnon really, really well. 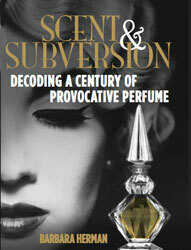 Great review of an elusive but intriguing scent. Green, chypre, leather--everything I crave in a perfume, along with a Latin name suggestive of gender crossing. What could be better? I hope to track some down eventually. It's wonderful to see new posts popping up here after your short time out for the publication of your book. Love your blog, love your book, and I love discovering new vintage perfumes. I just wanted to say that perfume stinks. Perfume is illness in a bottle. I do not appreciate perfume at all. It give me breathing issues. People should refrain from stinking the whole world down in this crap called perfume. I and thousands of others would do much better without it. When you fragrance you pollute the air we all must breathe to live. And when I and others with lung issues inhale perfume we become acutely ill in breathing difficulties. Restrained breathing due ot you pollution and obstructed airways. I would love more information on this brilliant perfumer who made some of my all time favorites...Anais, O and my beloved Metal. Perhaps one day you will do a review on Metal? Sadly, vintage Quiproquo never made it my way but I am certain I would have adored it. Great review, B! The review of Metal is in my book, Brigitte! Cabochard was my very first "grown up" perfume. It was given to me on my 15th birthday, many, many galaxies ago. Quiproquo soon followed. I cannot remember what it smelled like, but I remember I loved it. "Cabochard's little sister" is right on. Selling original perfumes all brands, very special prices.